Hours and dog policies frequently change with these small businesses so please check before visiting and let us know if any changes so we can update these listings. You'll find a lot of authentic Italian dining since the area had a lot of Italian settlers -- enjoy! Volcano Union Pub serves Thurs - Mon on their dog-friendly outdoor patio in Volcano (8 miles). The shaded patio is quite popular so reservations recommended. Bistro49 Foodies will enjoy these chefs' talents and their personal touches. Dog-friendly patio. Mel & Faye’s Diner Great burgers! Nice patio dining with dogs allowed outside. Brickhouse Brews is our favorite brew pub in downtown Jackson. Great burgers and craft beer from Amador Brewing Company. Jackson Rancheria (7 miles) has a steak restaurant (Lone Wolf), Asian/Californian grills, bakery cafe, and buffet. 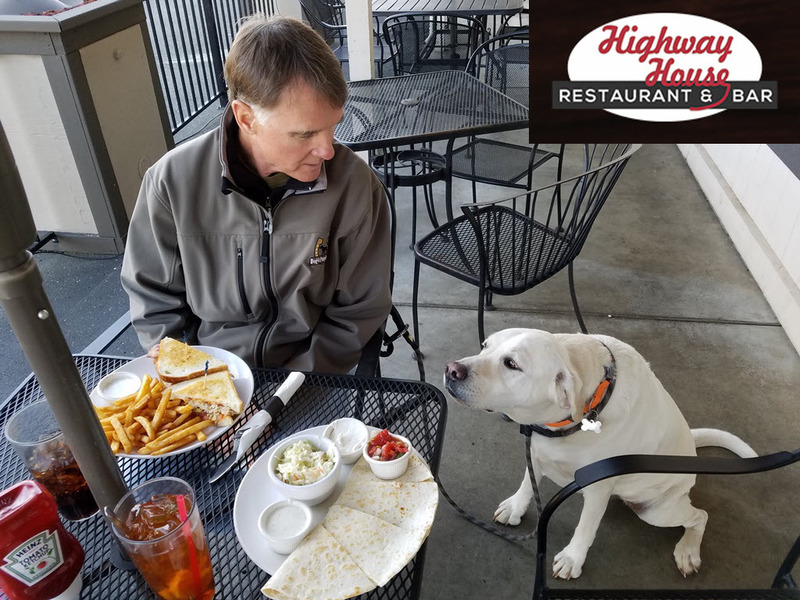 Most fast food chains can be found on Hwy 88 or Hwy 49 and some have outside eating to include pets: including Dickey's BBQ near Safeway, Subway, McDonalds, Burger King, Kentucky Fried Chicken, Taco Bell, Round Table Pizza, Mountain Mike's Pizza, Baskin Robbins, Denny's. Starbucks: one near Safeway and one near Raleys. 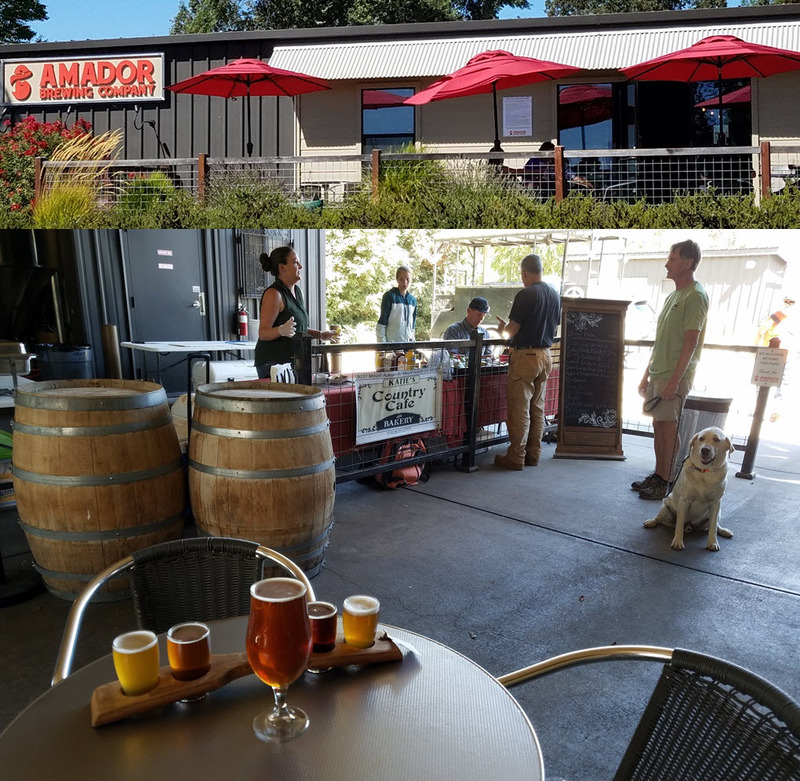 Amador Brewing Company in Plymouth (20 miles) allows dogs on outdoor front patio AND in a warehouse-like sheltered covered area where you'll likely find lots of people with dogs enjoying Amador's craft beer Fri - Sun. Provisions in Sutter Creek (12 miles) Live music many nights with fine food in this tap room. Swingle's Meats. People drive great distances to buy the delicious marinated meats from our local butcher just off Hwy 88 on your way to the Ranch (look for the steer sign). Highly recommended for those planning to BBQ. Groceries including deli at small Pine Grove Market (5 miles), full-sized Raleys (9 miles) and Safeway (11 miles). Farmers Markets. Amador County is an agricultural mecca not only for vineyards but also other products you would hope to find at a farmers market. Mother Lode Exchange. Year-round market open Wed and Sat 11am-3pm in a historic Jackson building. Live Music Country towns bring performers up-close-and-personal with many including outdoor venues during warm summer nights. Theater Productions Small town charm in local performances with inside and outside stages. Jackson Indian Casino (8 miles) offers 7 days per week, 24 hours a day action. Slot machines, bingo, blackjack, and other card games are available. There is a game arcade for the kids.